Kumarakam is a little Island on the Vembanad Lake, and this is a most popular tourist centre in Kerala and is located in Kuttanad, Kottayam district. 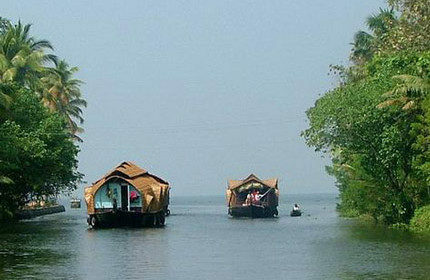 This is one of the famous backwater destinations in Kerala. The natural beauty of Kerala is well showcased in Kumarakom. This is a beautiful paradise of green mangrove forests, coconut groves, green paddy fields, waterfalls, blue skies, cuckoo, wild duck and bird sanctuary. This eye catching sight can peacefully calm and invigorate your mind with renewed inspiration for your life. Location: 16 km away from Kottayam town. Nearest Railway Station: Kottayam ( 16 km ). Nearest Airport: Cochin International Airport, about 85 km from Kottayam town.